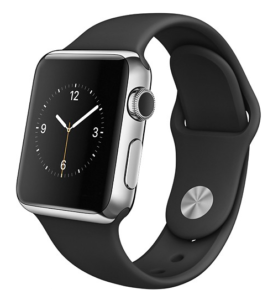 Best Buy has the Apple 38mm Stainless Steel Sports Watch with a Black sportsband, for $249 with free shipping. That's a $300 savings! It features a Retina display with Force Touch, 802.11n wireless, Bluetooth 4.0, sapphire crystal, stainless steel case, ceramic back, silicone sportsband, heart rate sensor, accelerometer, gyroscope, speaker, and microphone. It's water-resistant up to three feet.